Introducing Todd Paschall of Crochet By Numbers. I learned of Todd Paschall through a friend, Veronica, who was working on an heirloom portrait of her parents at the dinner table at their wedding. The picture dated back to the 50’s. She was crocheting a replica as an afghan and using a pattern created by Todd. I was taken back by the detail. I watched her gladly go through the stitches. I was blown away by the detail of the pattern but how simple it was as well. I was floored at the 45 pages of the pattern stitches required, but as Veronica demonstrated to me, it’s not as daunting as one might think. I was amazed how fast it was too! Todd’s patterns take the mystery work out of the photograph. There’s no counting of boxes in a diagram. So you don’t have to sit there and count really tiny boxes to ensure you get the pattern right. Todd has simplified the process. To protect his methods of achieving the pattern, I am choosing not to elaborate on how he does what he does. His patterns range from $75 which include an online class on how to do his methods. He will also create the pattern for a photograph you have submitted. He’s great for giving tips on what kinds of photos work the best. With Crochet By Numbers, you don’t sit there and count boxes like you might be thinking. Todd has it worked out for you to follow along with very simple directions. In watching Veronica work, I noticed she labelled a code number on her yarn balls to match Todd’s pattern. Veronica was commenting that it’s easier if she labels the ball with the code number to prevent herself from making an error of choosing the wrong yarn when doing the details. Very bluntly speaking, many crocheters will believe his price point is out of line. The truth of the matter is that Todd’s method is a huge time saver and is generating a pattern that is unique to you. I believe that you won’t just flip through your photos and just randomly pick a photo to transform. Crocheters will carefully choose because they know the project is going to be exceptionally meaningful at the end. His pattern pricing is extremely reasonable considering the details and customization qualities. Veronica was commenting how nice Todd is to communicate with. She ordered 5 patterns from him once she realized how simple his method was. I think she is hook’d, but in a fabulous way. She’s even smiling while crocheting which shows her enthusiasm and personalization to the pattern. Occasionally, she rests the afghan from a distance to see how she is progressing as it’s not always easy to tell from close up. She is going to frame her afghan as a wall hanging afterwards. If this is something you are even remotely interested in, visit his facebook for examples and communications directly with Todd, Crochet by Numbers. 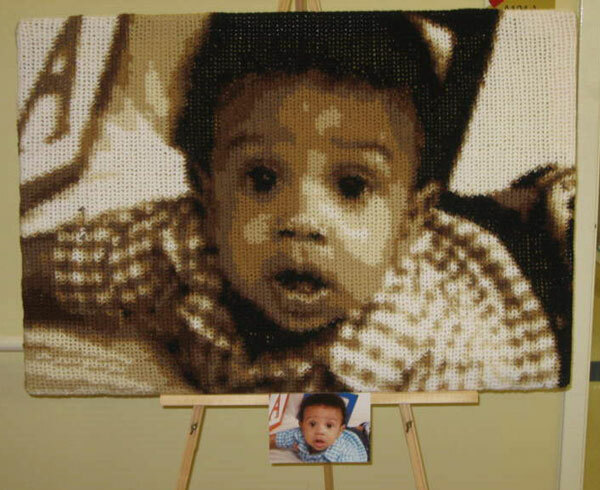 This entry was posted in Fascinating People, Product & Service Reviews and tagged Art, Cathy, Craft, Crochet, Crochet Masterpiece, Facebook, follow, Knitting and Crochet, Mikey, Pattern, Photo, Pictures, The Crochet Crowd, Todd Paschall, Yarn. Bookmark the permalink. Mikey did you know there is an offshoot of cbn already… The young lady is amazing she lives in australia and has several awards from her full color pieces… Her name is Lee Mac and her site is http://www.totallee.net. She has step by step tutorials and even some free patterns!!! Which is awesome while you are learning! She is also on ravelry as totallee and a group on there as well http://www.ravelry.com/groups/totalleenet-off-the-hook !!! Check it out! Now she did learn from Todd and he is amazing for creating this technique! But she has taken it beyond the par. Thanks so much for the tip!!!! Morning Jan, I suggest you ask Todd to break down the costs for you. http://crochetbynumbers.com I don’t believe you get a program. You get the tutorial to show you how to do the concept and then your photograph is converted to a pattern. I could be wrong, I would suggest emailing him through his website to ask him. He’s a really nice guy and people who have dealt with him say he’s really great to communicate with. I have been communicating with him as well and find the same thing. Thanks, Mikey! Will let everyone know what I find out!